Patios stand up to temperature extremes along with rain and snow, like we have here in Maryland, much better than wood or composites. Because of this, a properly installed patio can last a lifetime. Recent improvements in hardscaping manufacturing offer homeowners almost endless design options. 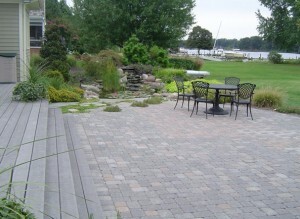 Patios can be built with pavers, natural stone or even porcelain tile. You can use a variety of shapes, colors and styles to achieve the desired look. Decks only offer one look. They can be stained or colored, but you have very few designs options beyond that. Also, Adding a deck increases property taxes because they are considered an addition to the living space. A patio will let you take advantage of that same space without adding to your real estate taxes. F.A Hobson Custom Built Patio for your Delmarva Home!